Obituary – Myers, Helen Mae (McCord) « Perry High School Alumni Association, Inc.
– 18 year old daughter of Mr. and Mrs. W. A. McCord. She was born in McRay, Ark., December 31, 1921, and attended the Lutheran schools for eight years before enrolling in the Perry high school. During her freshman year, she was a member of the Red Hot pep organization. Her hobby is collecting poems. Helen does not have any definite plans for next year. Helen Mae Myers died at 7:05 a.m. Sunday in El Centro, California. She was born December 31, 1921, the daughter of William Albert and Laura (Armstrong) McCord. 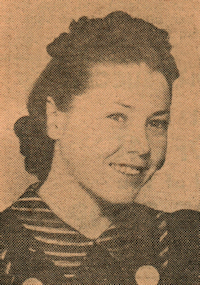 She attended the Christ Lutheran school in Perry and was a 1941 graduate of Perry High School. On September 3, 1940, Miss McCord married Alvin E Myers. She is buried at El Centro, California.